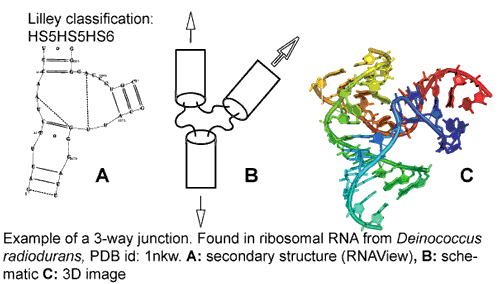 What is an RNA junction? For the purposes of this database we have considered internal loops, bulges, kissing loops, and junctions to the 9th order (9-way.) Fig. 1 shows one of the 2,337 three-way junctions (3WJ) identified by JunctionScanner. A junction or branchpoint in RNA is defined, by the International Union of Biochemistry and Molecular Biology, as per Lilley et al. 1995, as "the point of connection between a number of different helical segments." What are kissing loops and bulges/internal loops? A kissing loop is the meeting of two curved strands of RNA with portions of bases that pair with each other instead of the opposite strands in their respective helices. An internal loop is a small segment of unpaired bases in a longer paired helix. Bulges are regions in which a strand of a helix has extra inserted bases with no match in the opposite strand. How many junctions have been found? Our group has documented and made available 13127 junction and kissing-loop structures. How can I link to a particular junction? n is the junction id which corresponds to the junction you are looking for. The web site and database were developed and implemented by Bob Hayes, a student in Bruce Shapiro's group, part of the Nanobiology Program at the National Cancer Institute. The data was obtained by Eckart Bindewald using a program he developed for that purpose.